Roop pointed out a story in the day’s newspaper to his wife. “Navjot (Singh Sidhu) is also married to Navjot,” he winked at her. He watched the wondrous smile spread across her face. He loved to make it happen, the way she curled one corner of her mouth and gradually let her happiness travel across her lips to the other corner. That smile was what had attracted him in the first place. She was reading a book in the Metro and he was hanging on to the overhead bar, buffeted about by the milling crowds. He was about to give it back to a man who had given him a rather nasty shove, but he saw her shake her head as if in exasperation. And that mesmerizing smile began to appear. “Cheshire cat!” he thought to himself, not entirely in a charitable mood right then. Two stations later, he was still staring at her. He wondered if the wearer of the smile would still be there if he blinked. He blinked, but she was still there, smiling as she continued to read. He was lucky it was a Saturday. Office was over for the weekend, and he had to meet a vague acquaintance late in the evening. So he would travel with the Smile, maybe even follow her off the train. The crowd had thinned out. He hoped he would get to sit next to her, but got a seat opposite her instead. Peering at the book, he realized she was reading PG Wodehouse. That explained her amusement. “Our tastes match,” he thought happily. Right then she looked up, and caught his intent stare. “What beautiful eyes!” he told himself, forgetting to look away. An unidentified caller broke the silence. “Roop here,” he spoke into the phone. The look from across the aisle was murderous. His voice trailed away, and he forgot to carry on the conversation. The Smile was positively livid at something he had said or done. He wondered why she should take such umbrage to him. Suddenly she was looming over him. “How dare you?” she hissed at him. “How dare I what?” he asked, bristling a little. “How do you utter my name?” she spoke menacingly. “Your name? How would I know your name?” he demanded, as agitated. “Roop. That’s my name,” she whispered fiercely. “Really? Mine too,” he extended his hand quite involuntarily. “Shut up. Can’t be,” she said, now a little confused. “Please sit down. I’ll show you my card,” he pleaded with her. They made their way to a vacant twin seat. She looked at his card case. His name was embossed on it. This was too much of a coincidence. They had the same family name too. “Hi,” he held out his hand again. She shook it, a little shy. Before they parted that night, they had become good friends. They had disembarked near a shopping mall, strolled around, wanting to know everything about each other as if there was no tomorrow. She was three years his junior, had arrived in the city two years ago and lived with relatives, near the commercial complex housing her office. Today she had come out to shop. He helped her with the shopping, carrying her bags and stuff, telling her about his home and family. He lived away from them, close to his workplace. On the way back to the Metro station, they exchanged phone numbers. They were madly in love already. It took them just weeks to get to the proposal stage, and in three months they were planning marriage. 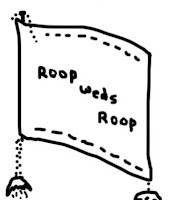 “Roop weds Roop. This is the biggest joke I’ve heard,” was his mother’s first reaction. His brother joined in, laughing his head off as he repeated the words. Initially it upset him a lot, but he saw the funny side of it soon enough. “Tell me, how many such couples do you know?” he challenged his brother. “None, and I don’t think I will,” his brother replied. “That’s the best part. Imagine all the confusion arising out of addressing the man, and the wife responding instead. Or the reverse. This gets better and better!” Roop exclaimed. His father joined in in the mirth, saying he was open to having Roop and Roop in his family. He met the girl and liked her matter-of-fact attitude. The name was of no consequence in such matters, he declared. The bride-to-be was met with consternation back home. Her granny expressed vehement opposition to the “same-name” marriage. “It’s the not the names but two people who are getting married,” Roop protested. “This is just not done. He must change his name, in that case,” Granny announced. “Why should you? It’s your given name. We’ve always called you that,” Granny replied. Also, the perspicacious niece pointed out, the families need not be too concerned. Except that there could be confusion with their credit cards or phone calls, there would be faces to the names on their identity cards and passports to distinguish between husband and wife. Moreover, since they would be living by themselves, there would be no daily confusion over who was being called. Imitating them, she said first, in a feminine voice: “Roop!” Then, with a masculine ring: “Yes, Roop, darling wife!” Roop should have been there to see the Smile. Her parents did not want to comment before meeting the “boy”. The name was a bit of a tricky affair, but all else about him was unexceptionable. They also turned out to be distantly related. His family seemed affectionate and their daughter was very much at ease with them. That mattered most. There were some hilarious times in the run-up to the wedding. The slender bride’s grandfather was startled when he saw a rather large ring bought for Roop. He had a good laugh on being reminded that the bridegroom went by the same name. Though the invitation cards were clearly inscribed with “Roop weds Roop”, the wedding guests made quite a thing of the unusual pairing of names. The priest who performed the marriage rites too kept tripping over the shared name. Then there was quite a scene when they went to get their marriage registered. It took a pile of documents and their marriage album to convince the official concerned that all was above board. As if to put them at ease, some people obligingly told them of other same-name couples they knew. Once they even shared a coupe in the train with another same-name couple, much older, who regaled them with their own experiences. Their so-called offbeat attraction had endured well. They were always scanning names, sharing a laugh when they found “Taylor to wed Taylor” or something like that. She was pregnant now, and they giggled over the prospect of filling up forms with common entries for “Mother’s name” and “Father’s name”. As their hands met, her smile broadened into a grin. Roop grinned back at Roop.